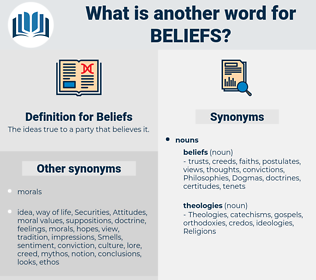 What is another word for Beliefs? The ideas true to a party that believes it. 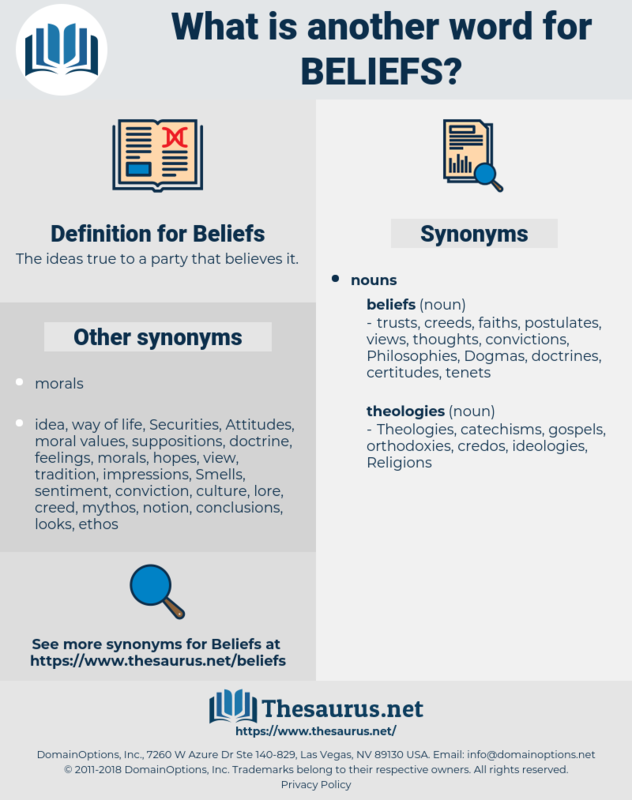 faith, faiths, doctrines, religion, Religions, thoughts, Sentiments, confessions, preconceptions, persuasions, outlooks, creeds, precepts, Dogmas, tenets, views, convictions. perspectives, view, views, opinion, opinions, impressions, voice, advice, input, smoking. principles, interpretations, believers, misconceptions, followers, belonging, ideologies, thinking, understandings, minds, Sensibilities, assumptions, notions, assertions, worldviews, Attitudes, Suggestions, denominations, viewpoints, affiliations, allegiances, allegations, values, traditions, religious, observations, Intentions, considerations, propositions, observances, representations, ideals, ethics, estimates, arguments, desires, predictions, FIDE, Fides, judgements, Judgments, stereotypes, rituals, Certainties, Aspirations, collections, advocates, standpoints, constructions, projections, Visions, Cultures, Prejudices, assurances, ambitions, forecasts, rites, EFS, positions, exhibits, performances, fe, motives, sects, respects, reasons, concepts, feelings, headings, paradigms, images, admissions, wishes, acquisition, valeurs, insights, Voices, grounds, principals, submissions, civilian, notices, approaches, constructs, Ceremonies, points, inputs, Securities, purchases, Activities, acts, ties, backgrounds, Ones, advisories, smoke, civil, smokers, designs, ratings, pas, Youths, perspectives, Guns, opinions, young, impressions, smoking.
" Once under the influence of our atmosphere and our beliefs," avowed Blaney, " your soul expands and flowers out like a star!" As the memory of the real history of these beliefs grew dim, confusion was rapidly introduced into the stories. bell buoy, bilby, bay leaf, belly whop, bolivia, bio lab, blowup, blip, ball up, blow off, believe, bleb, bivalve, blowpipe, ballup, bible leaf, bellhop, blue pea, blabby, blue baby, blue poppy, bully off, bull bay, bleep, beowulf, belly-up, balboa, bluff, blub, blow up, bellboy, ball boy, bully beef, bullyboy, bulb, blab, blebby, bailiff, bivalvia, bubble up, blob, behalf.